Thursday Night temperatures in India. Lowest in Kashmir: Darbuk: -25c, Leh:-9.6c,Kargil: -9.4c, Gulmarg: -7.5c.and Pahalgam: -6.4c. Lowest in H.P. today: Keylong:-7.1c, Kalpa:-4c. Cold Wave in Orissa: Lowest at Phulbani: 4c. Cold Wave in Interior Karnataka: Mysore: 9.8c.Lowest ever for December. HAL, BIAL and Yelahanka recorded a minimum of 9 degrees—six degrees below normal.Bangalore’s lowest temperature ever recorded was 7.8 degree Celsius in 1883. 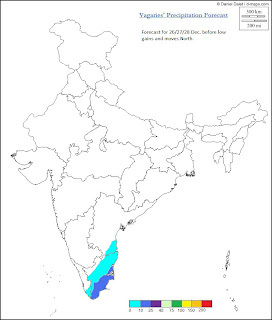 For North India a chilly and wet New Year's Eve seems to be on the cards.A W.D. would move westwards into N.India, and by 29th, we could see precipitation in the region. Snow in Kashmir, rains in the plains of Punjab, N.Rajasthan, Haryana and Delhi. Since the W.D. aloft may not last beyond 48 hrs, precipitation in these regions could give in to a cold wave, with nights getting cooler by 3/5c,after 1st. Jan 2011. Of-course, this being a 5/6 day forecast, dates could vary a day either way. For this region, we see an easterly wave, a semi active MJO, approaching the T.N. Coast and adjoining Sri Lanka coast.After the 3 dry days forecasted by Vagaries, I would estimate rainfall to start increasing along the T.N. coast from 26th. A gradual increase in rains would continue into 27th./28th. when, a low pressure is expected to be embedded in the wave. If, the MJO gets active, we can expect the low to become well marked , and move Northwards along the coast, hence more rain from 27th. along T.N/South A.P. coast,and interior T.N. If,in any case, the well marked low crosses the T.N./A.P. coast, we could see the rains spreading inland 0n the 29th. into interior Karnataka/ A.P. and even southern interior regions of Mah.may possibly get showers. This W.D. will precipitate snow/rains in the extreme Northern regions of Pakistan on 28th.Rest of the Sindh and Punjab regions will be cloudy. Karachi caould expect cloudy weather on 26th/27th. Possible fog on 27th. Cold wave in all the regions from 29th. and temperatures dropping by 3/5c. In Nepal, Khatmandu fell to 1c on friday. Some rains/snow is expected in western parts of the country on 29th. Cold spell drop in temperatures again from New Year. emkay, a W.D. will precipitate rains in Delhi as mentioned around New Yaers Day. By 2nd. things will clear up. I see high dew point (fig)on the 3/4. but diminishing dew point (less fog) from 5th. So, as of ow, 7/8/9 should bring shallow fog to Delhi IGI airport. Remind me for update around 1st. if needed by you.